By the end of the week especially on Fridays, I prefer to make something that is quick and easy like hakka noodles. Though prepping the fresh ingredients takes some time, once ready, the dish comes together in minutes. Pairs well with manchurian chicken gravy and enjoyed by the family!!! Restaurant owners of Hakka origin introduced their cuisine to India, the dishes adapted to suit the Indian palate. 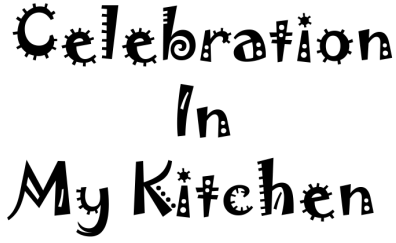 Though the authentic hakka style is unknown, each cook has his/her own version. 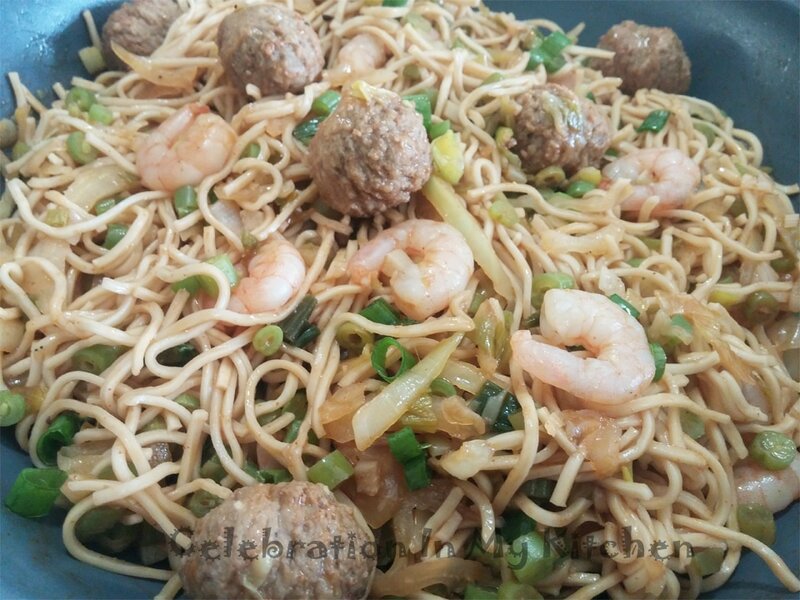 The noodles are first cooked in boiling water till al-dente (firm to the bite) and then tossed with the vegetables, chicken and/or prawns along with the various sauces. A popular street food in India that can be prepared quickly with any ingredients on hand. Shell and devein the prawns. Wash and season with salt. Trim the ends of the green beans, cut each thinly either diagonally or crosswise into small pieces. Peel the carrot, cut the ends off and dice thinly either 2-inches lengthwise or crosswise into small pieces. Wash green beans, carrot pieces and peas in a colander, drain and set aside. Mix all the ingredients under sauces in a bowl. Bring a pot of water to boil, add the noodles and salt. Once the noodles soften slightly, use a kitchen scissor and cut through the noodles into small pieces. When noodles are half-cooked, include the vegetables. When noodles are al-dente (firm to the bite), drain the noodles along with the vegetables into a colander. Simultaneously, while the noodles are cooking, heat a wok with oil on an adjacent stove. 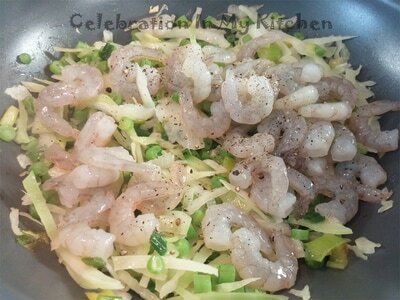 Add onions (reserving some greens for garnishing) and garlic, fry for few seconds and then stir in the prawns with freshly cracked pepper. 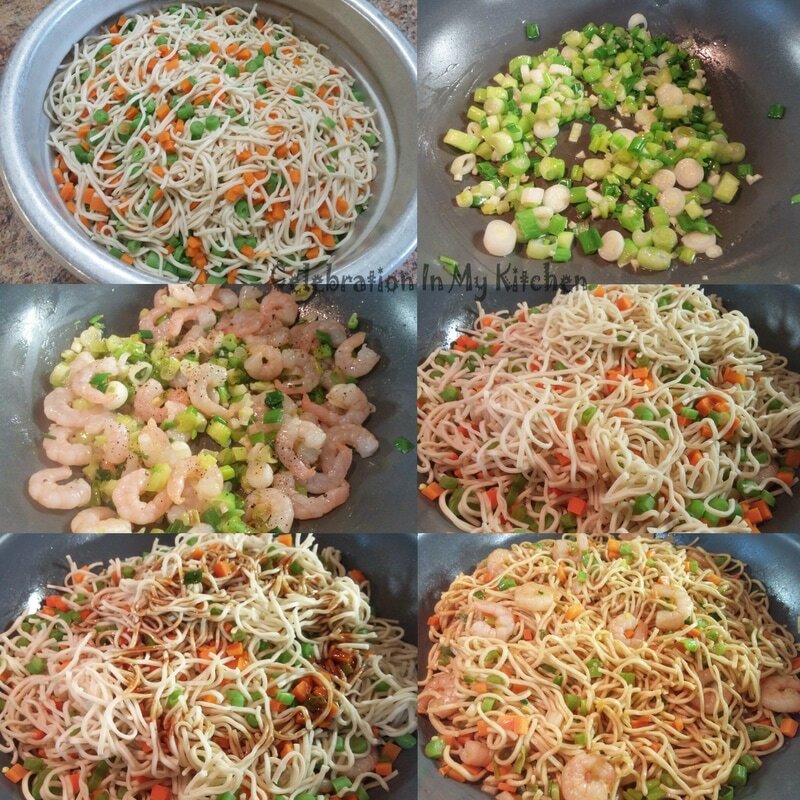 Cook for a couple of minutes, mix in the drained noodles with the vegetables and sauces. Toss using a pair of tongs to coat well. 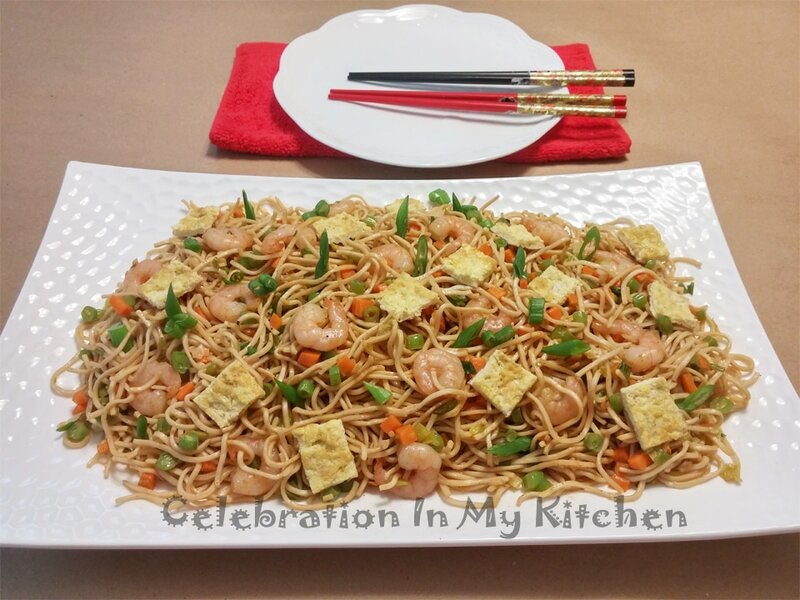 Serve garnished with reserved green onions and egg strips. Lightly beat eggs with salt and pepper powder. Heat 1 teaspoon of oil in a skillet and cook an omelette. Cut into strips and use as garnish. Half pack of instant egg noodles (picture above) were used. Sriracha hot sauce can be replaced with your favourite chilli sauce. The following day for lunch prepared noodles again with green beans, cabbage, prawns and meatballs from Ikea (pictures below). Since the meatballs are already cooked, added them in the boiling water, followed by the noodles. Simultaneously, on the adjacent stove, sautéed the green onions and garlic, with the vegetables included and cooked for a couple of minutes with the wok covered with a lid. Using an Asian spider strainer (picture below), transferred the noodles and meatballs from the boiling water into the wok. 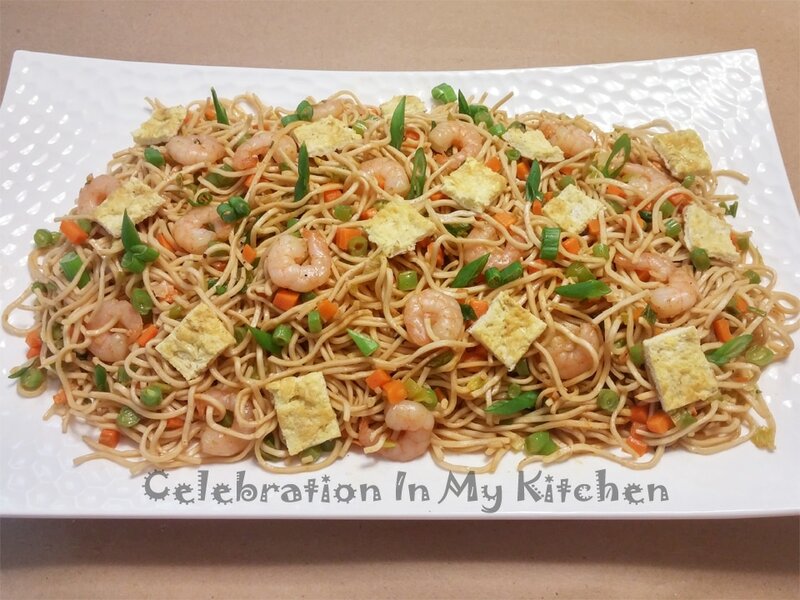 Mixed in the sauces, tossed the noodles, served garnished with some green onions. 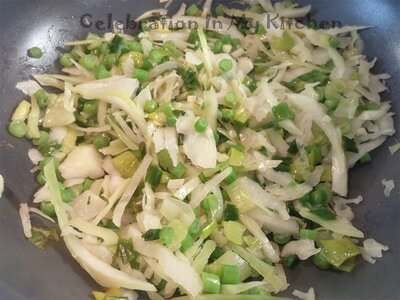 You can choose to include the vegetables at the last minute into the boiling water with the noodles or cook them directly in the wok after sautéing the green onions and garlic. I prefer doing the latter.